This “salad” dish is one of my favorites when I want something light and nutritious yet filling. It’s really not a salad, but I’m reluctant to call it a noodle dish since it has plenty of vegetables. A similar version was served to me in the Moss Room Cafeteria of the California Academy of Sciences. That was NOT the sort of place you would expect to find great food, but they do amazing job–particularly with their salads. I like this dish because it boasts a medley of flavors, textures and colors, and it can be served warm or at room temperature. 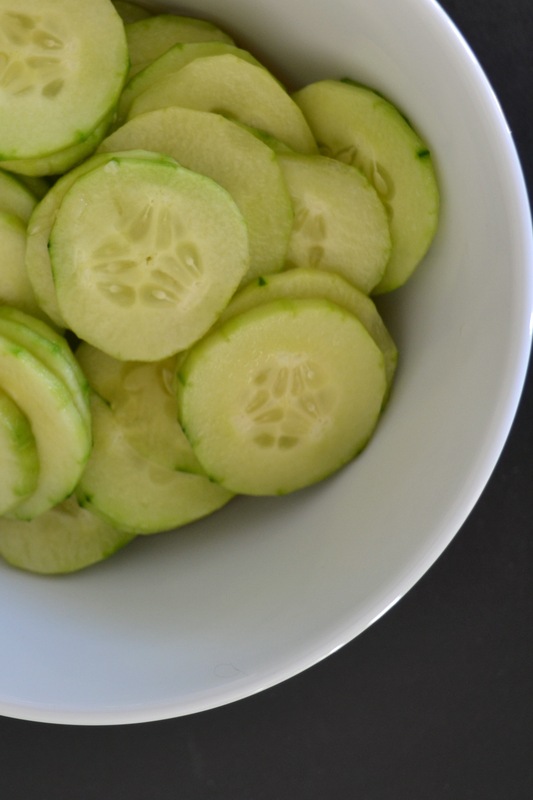 It’s also easy to prepare, although it’s best if you prepare the sweet pickles (or marinated cucumbers) ahead of time. 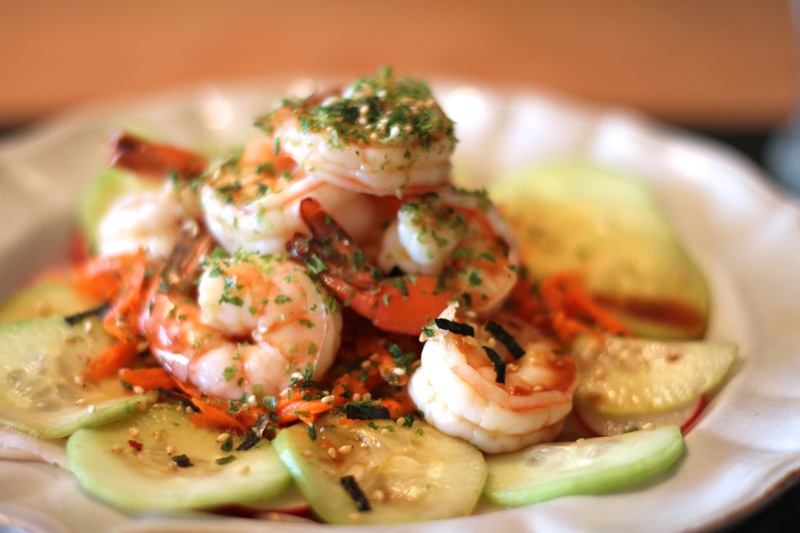 I’ll typically make the sweet pickles at the start of the week and then use them for this poached prawn dish as well as one of my favorite lunches, which I’ll blog about next time. Mix all the ingredients in a glass container with a lid. Shake well, then let it marinate overnight in the refrigerator. Boil water in a medium-sized saucepan. Toss in prawns and cook until opaque–approximately 5 minutes. Drain. Arrange handful of noodles in a pasta bowl. Sprinkle sliced radishes and cucumbers around the outer edge. 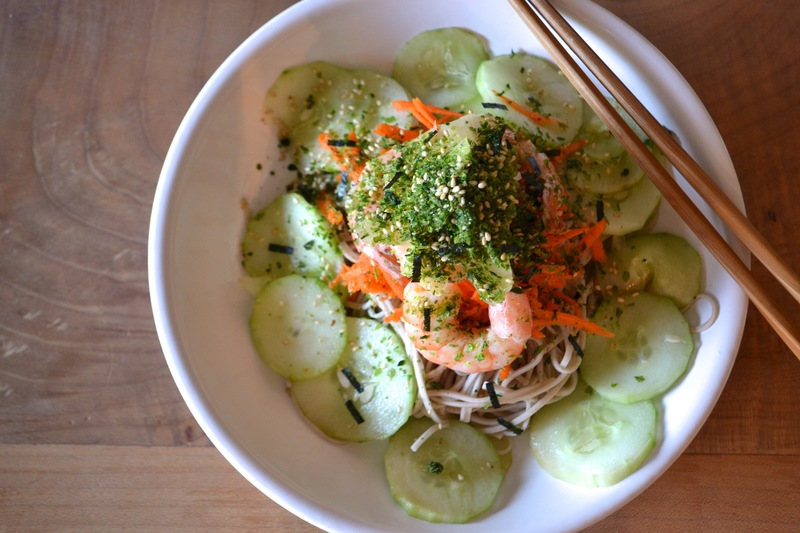 Place a small handful of grated carrot in the center of the noodles. Arrange the poached prawns on top. Top with pickled ginger. Spoon several tablespoons of ponzu sauce over the entire dish. Sprinkle furikake on the “tower.” Serves four. * Nori Komi Furikake is a rice seasoning made of sesame seeds, salt, sugar and seaweed. It’s available from any asian markets as it’s very common in the traditional Japanese home.